The Journeys Alternative Press Music Awards, Fueled by Monster Energy are thrilled to reveal this year's first wave of performing artists! In itself, the alternative genre is an amalgamation of different styles and influences, and with that in mind, the 2017 APMAs look beyond a single style of music to produce an entertaining evening for just about any music fan. This year's APMAs include something for everyone - featuring performances by groundbreaking critically-acclaimed rock band AGAINST ME!, No. 1 charting platinum stars ALL TIME LOW, ANDREW MCMAHON IN THE WILDERNESS (solo project of the SOMETHING CORPORATE and JACK'S MANNEQUIN frontman spawning alt-rock charting singles "Cecilia And The Satellite" and "Fire Escape"), rap icons BONE THUGS, multi-platinum GRAMMY® Award winning hard rock/metal legends KORN, Cleveland native and award-winning actor/rapper MACXHINE GUN KELLY, horror-rock favorites NEW YEARS DAY, massive award-winning Japanese rock group ONE OK ROCK, acclaimed rock group PIERCE THE VEIL, Billboard chart-topping rock radio darlings THE PRETTY RECKLESS and chart-dominating melodic rockers SLEEPING WITH SIRENS. More artists are set to be announced soon! This is a dream lineup for any alternative music fanatic with an expansive musical palate, showcasing leading artists and rising stars in rock, rap, metal, punk, pop and everything in between. KORN's Jonathan Davis states, "We're really excited to perform at this year's awards and are looking forward to seeing all our fans in Cleveland. I performed at the first ever APMAs back in 2014 with ASKING ALEXANDRIA and it's been awesome to watch how this show has grown over the years." Regular tickets are officially on sale now at www.altpress.com/apmas and start at just $40 to experience all the action the APMAs have to offer! In addition, VIP tickets are available - including Monster VIP Table, Ultimate VIP and Premium Seating packages - offering the best seat in the house. Visit www.altpress.com/apmas for more information on these packages, as well as more show details to be announced soon regardingnominees, honorees, red carpet appearances, surrounding events and more. On July 17, 2017, the fourth annual Journeys Alternative Press Music Awards, Fueled by Monster Energy will return to AP's hometown and the birthplace of rock 'n' roll, Cleveland, OH. The main event will once again take place at Quicken Loans Arena, home of 2016 NBA Champions, the Cleveland Cavaliers. 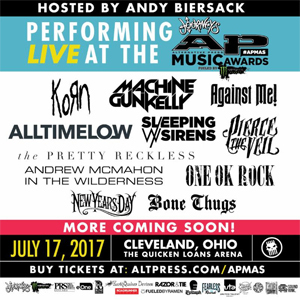 The 2017 APMAs will be hosted by alternative culture superstar Andy Biersack (of ANDY BLACK, BLACK VEIL BRIDES and star of the upcoming film American Satan) and showcase a refreshed, produced-for-television atmosphere to fully immerse fans in the action. Last year's APMAs trended worldwide on Twitter and Facebook for over 72 hours - before, during and after live streaming on Amazon Music's official Twitch channel, reaching over half a million viewers. The APMAs were the most viewed stream on Twitch the day of show, in addition to being the No. 3 most viewed music stream in the platform's history. Social media reaction and fan response spread fast and furious across the internet following the red carpet and awards ceremony, reaching 25 million people across Facebook, Instagram and Twitter. In addition, over 240,000 Twitter users tweeted the #APMAs hashtag during the show. The APMAs have featured performances and appearances by today's biggest rock stars- including TWENTY ONE PILOTS, PANIC! AT THE DISCO, FALL OUT BOY and Hayley Williams of PARAMORE- as well as musical legends such as Marilyn Manson, AEROSMITH's Joe Perry, Slash, JOAN JETT & THE BLACKHEARTS and Billy Corgan of SMASHING PUMPKINS. Additionally, the APMAs have presented extraordinary collaborative cover performances, combining the legendary talents of Joan Jett and Slash, HALESTORM and SLIPKNOT/STONE SOUR vocalist Corey Taylor, Rob Halford of JUDAS PRIEST and BABYMETAL and many more.